Our local District animal shelter was full and as rabbits don't adopt quickly, we were asked if we could help. 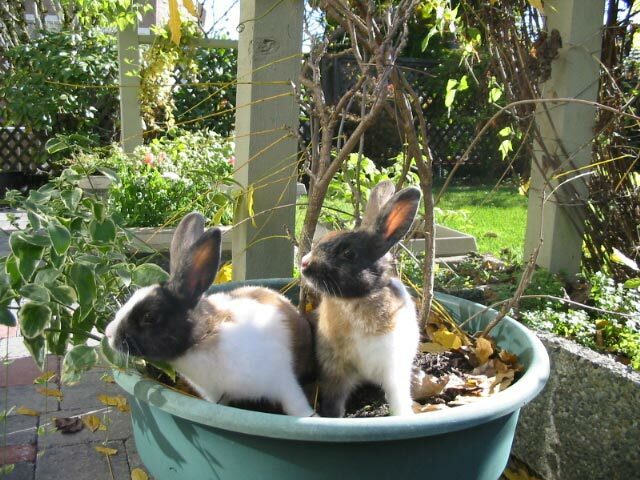 The story, as relayed to us, was that a relative decided it would be a nice surprise to give his young niece a couple of baby rabbits he had bred for her birthday. The parents soon found the care was too much and despite trying to do the right thing, it just wasn't working out. The family hadn't wanted any pets and the mother felt bad about the long hours the rabbits were being caged. 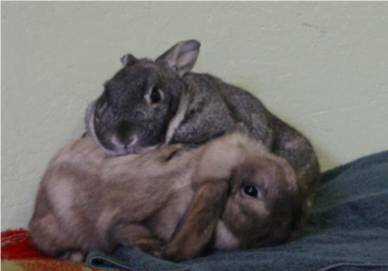 We took the bunnies in and offered to pay for the spay and neuter of the other rabbits, but our offer was declined. Otis has made friends with several of our other rabbits but Maple is somewhat dominant and tends to be a bit unpredictable and a bit of a biter. I don't think the others know quite what to make of him. Velvet, a shy Rex, had been surrendered to a local SPCA because she was "boring" and the kids wanted a kitten. 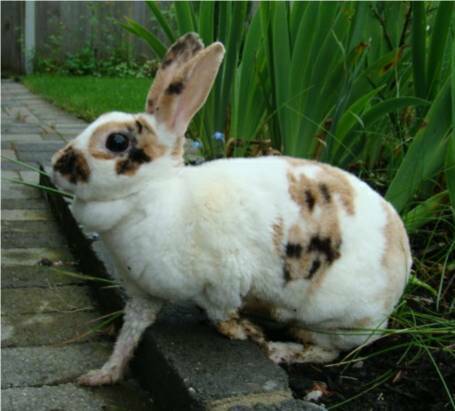 She had been caged most of her young life and at the SPCA she also wasn't given much chance to hop around. A volunteer said she was becoming depressed and that she needed a home with lots of room to exercise and play. 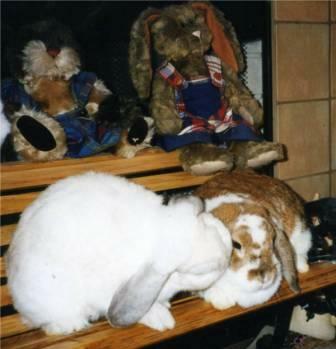 We provided that but she tended to spend a lot of time just sitting and observing the activities of the other bunnies. 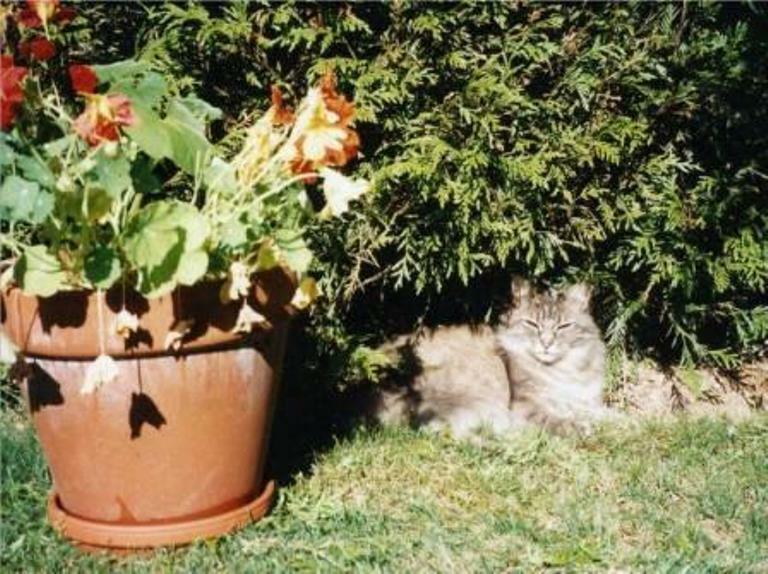 At times she showed interest in new toys or the garden, but in general seemed content with her own company. We enjoyed several years with her until she passed away. No post-mortem examination was done. The woman who called asked if we could please take Buffy as she didn't want to bring her to the SPCA. Apparently Buffy liked chewing wires and the husband couldn't keep her out of his office. It's the same story time and time again, people just don't commit to looking after their pets, and if they become a bother, out they go. 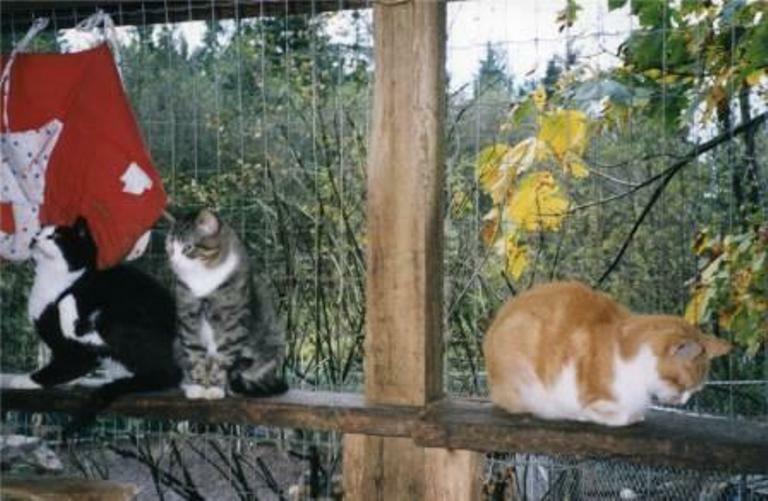 If they're brought to the SPCA, they often don't stand much of a chance. We took Buffy in, and about a month later Kiela was saved from one of the high-volume, high-kill branches of the BC SPCA. She had a case of untreated ear mites which had resulted in permanent head tilt. An immediate friendship was struck up when we introduced our latest rescues and gave them a second chance. A family in our neighbourhood was moving and one of their friends told me that they were looking for a home for their rabbit. I spoke to a young boy who said his bunny was eight years old and couldn't come with them. He added that she didn't like being played with and that sometimes she was aggressive. I took Flora in, and sure enough she had a fear based aggression. She continually lunged and grunted and I just had to watch myself when approaching her. Cause of death a year and a half later was probably uterine cancer which had spread to the brain. There was a parallel change in her behaviour at the same time we were given that diagnosis. Her mammary glands were also full of fluid. Corby and Noddy didn't have a good beginning in life. They were taken from their mom at four weeks old and given to a pet store. Kept in a tiny cage with no room to move around and staff who didn't have a clue about their needs, they existed for another month or so before we were told to go take a look at them. An employee said she thought the manager would let me buy them "for cheap" and to come back on her next shift. I did, and at that time she said she said the store was being "closed down", she was out of a job, and to take the rabbits. Shortly thereafter the business did close. Advertised on a message board outside a local pet store was information on a rabbit that needed a new home. I contacted the person and was invited to come over and take a look at the bunny. She was going to university and said she no longer had time for Benji. Her parents weren't interested, either. How sad it is that that people give up their companion animal (pet/s) so easily. These creatures are dependent upon us, yet our treatment of them is appalling. Luckily for Benji, he found a lifetime home with us. 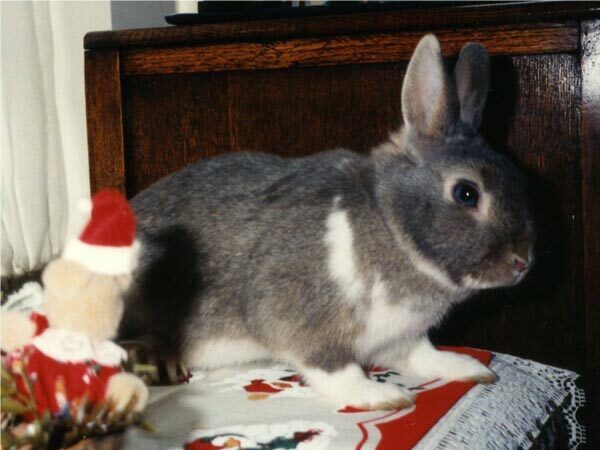 Likewise, so did Thumper, a trusting little fellow who gave back so much to us. We were fortunate to share many years together. It breaks your heart time after time when you hear yet another story of an abandoned pet. 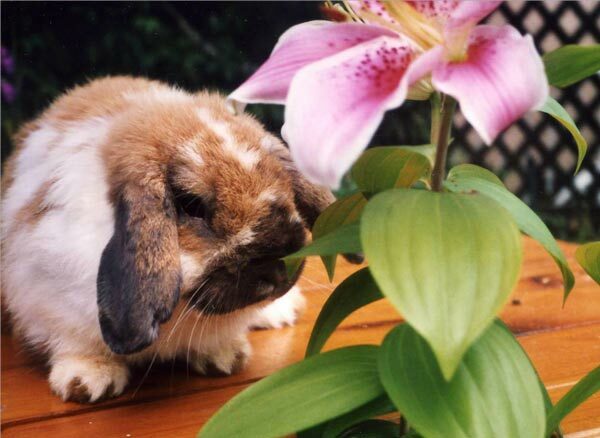 Tebby, a gentle little bunny, was surrendered after five years because the couple were moving back overseas. They had completed their schooling here and felt the opportunities were better if they returned to their country of origin. Molly, a two-year-old was given up because the person had evidently developed allergies. Allergies, moving, a new baby, the kids have lost interest, we're getting a new puppy - we hear it all the time. 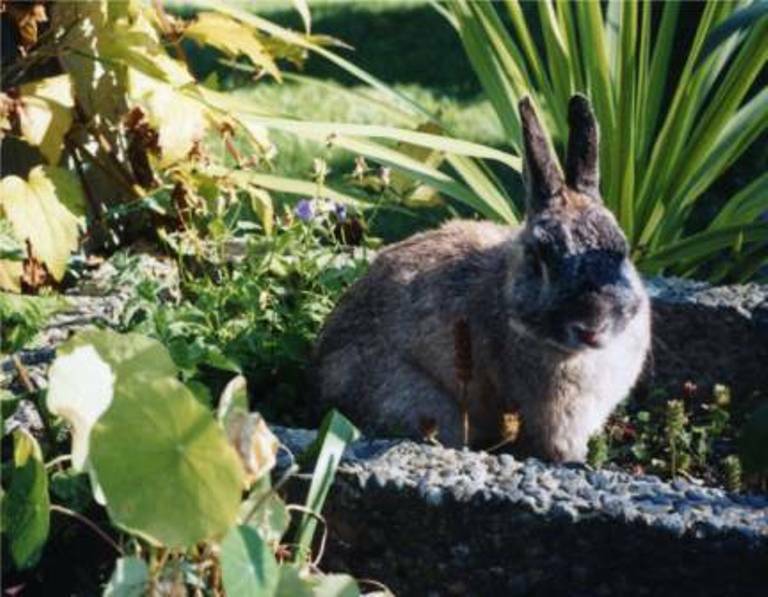 Stanley Park has been a favourite spot for people wishing to get rid of their unwanted domestic rabbit. One of our earlier rescues came from a mother and daughter who were walking one of the trails. They said a friendly brown bunny started following them and when they returned he was still there. They decided to pick him up and bring him home. They phoned us and asked if we could kindly take him in. We met at a local vet clinic and this little fellow was turned over to us. After Nutmeg was neutered he joined the others, spending many a happy year with us, enjoying the good life. Max, Zack, and Mo-Mo were all impulse buys. Bought through pet stores which contracted with commercial breeders and then surrendered by their owners to their local SPCA, these cast-off bunnies were feeling the stresses of being confined to tiny cages. In our throw-away society even sentient beings are considered items to be disposed off when the novelty has worn off. Putting companion animals to death simply because of a surplus is something we must actively fight against. Having a pet is a privilege, not a right. Backyard breeders are in communities everywhere. On a drive through a rural area we noticed a plywood sign reading "baby bunnies for sale." Turns out it was a young girl and her brother making some extra cash. They were getting rid of their stock because the property was rezoned for development. They planned to leave the ones behind they couldn't sell. We returned to the property which was now vacant about a month later and found Marvin running around. The only other evidence left behind were a few dilapidated wire cages at the far end of the yard. 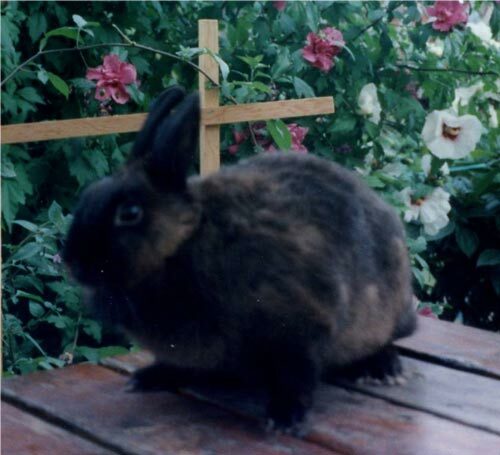 Bingo was a classroom pet and once summer holidays came he became unwanted. Teachers, students, and parents were busy and didn't know what to do with him. He was turned in to a humane society and from there came to us. "Pocket" pets are often exploited as teaching tools, and discarded once their usefulness has been served. Keeping little critters confined to cages and then disposing of them teaches neither responsibility nor compassion. All companion animals require specialized care and hamsters, guinea pigs, and the like are no exception. They are valued members of our society and as such, we are obligated to provide that care. There is a distinct human-animal bond and Bingo, with his lively personality, touched our hearts. 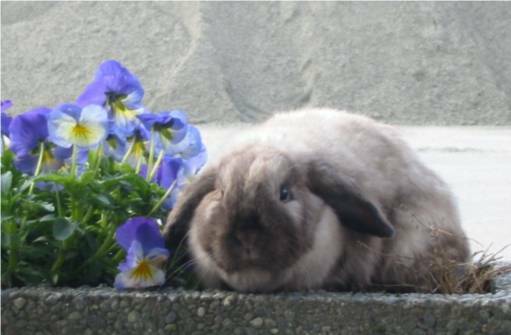 A kindly woman resident in a seniors centre in Burnaby first noticed Bonnie on the street in front of the complex. It was raining heavily and she was taking refuge under a parked car. 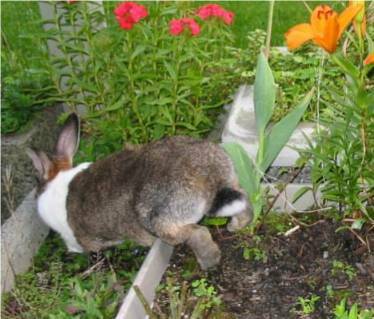 Next morning the bunny had moved to the shrubbery outside her patio door. 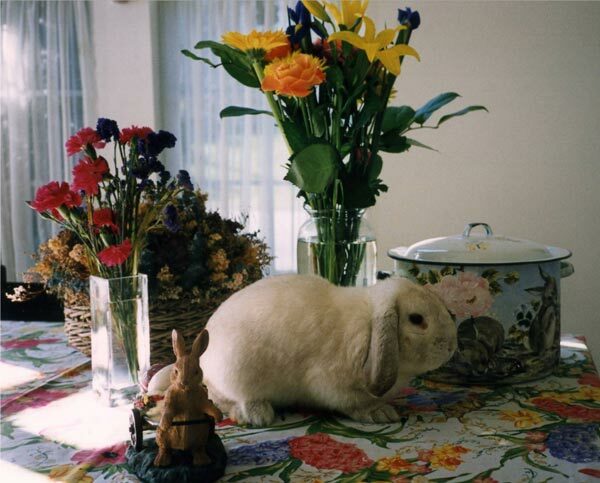 Over a few weeks time the bunny would hop inside, be fed, and take to resting in the kitchen. This couldn't keep up indefinitely as it was a ‘no pets’ building so she came to live with us. About the same time there was a rabbit running around our neighbourhood that nobody could catch. Finally we caught her and put up a 'found' notice. The family was contacted and came to reclaim Stephi. They said they’d secure the outdoor living area, but never did. A few days later we had her back and the ‘owners’ never once contacted us. 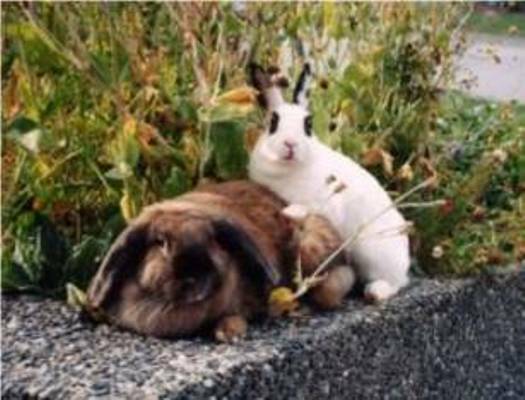 Annie and Millie had both been surrendered to the Surrey SPCA's Learning Centre where kids were taught about rabbit and small animal care. The centre rescued rabbits from within their own branch that would otherwise have been killed, a routine procedure for this facility. At the time we visited on a regular basis and became friendly with the assistant program coordinator. When head office began "restructuring" there were cutbacks and eventually the program was phased out. 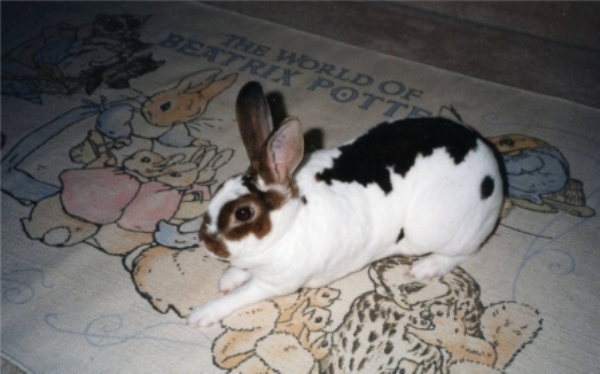 When it was operational a number of bunnies, including Annie and Millie were transferred to us. 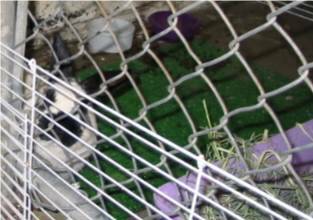 As my husband drove into the SPCA he saw two rabbits sitting in a cage beside the building. Upon inquiry he was told that staff had refused to take the rabbits, and hadn’t noticed that the owner had left them behind. As they hadn’t been logged in we asked if we could take them home. I had adopted a number of rabbits from this branch previously, but this staff member was obstinate, and refused to transfer them to me. She actually said I had to wait seven days because she was logging them in as strays. I later learned from a different employee that another rabbit had lost its life in order to make room for the newcomers. 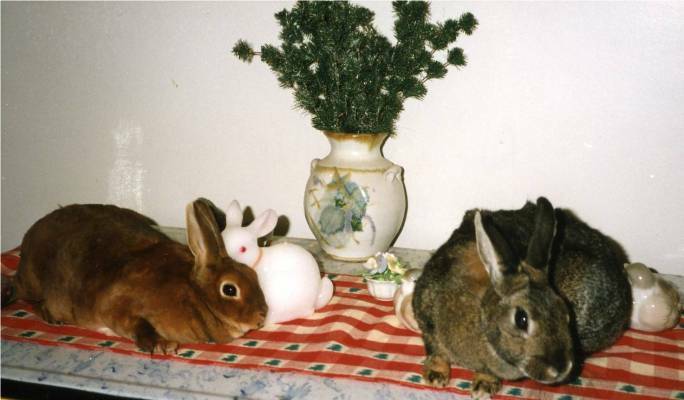 They were unsterilized and put in separate cages, which took up the table space allotted for rabbits. Finally, on a snowy day seven I drove down, paid the fee, and brought Moffat and Heidi home. Zack and Blossom met after we saved them from the SPCA. 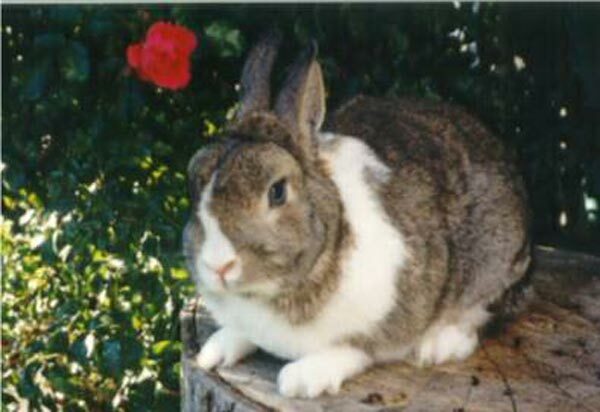 All too often rabbits end up unwanted after having being bought as babies from a pet store, a backyard breeder, or from young girls involved in 4H Clubs. 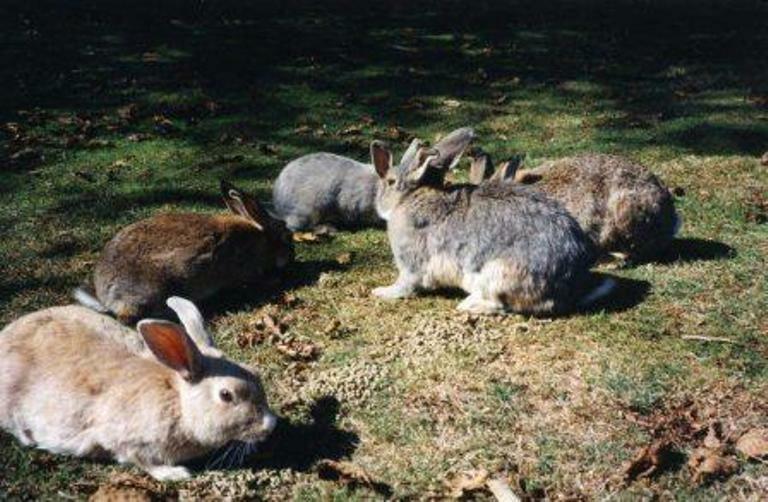 A number of our local breeders are involved with the American Rabbit Breeders Association, and sell their rabbits to others within their network, where they are shown and bred until they become unwanted. 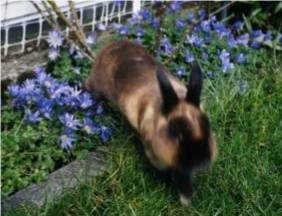 While Zack is a bunny full of curiousity, Blossom hadn't fared well after being surrendered to the Surrey SPCA. She was depressed and uninterested in her new surroundings, and despite several visits to the vet, nothing appeared out of the ordinary. However, several months later there was a rapid deterioration in her health and she was euthanized. Some years ago, a landlord made an unexpected find after having evicted the tenants. Among the items left behind were aquariums full of mice, some small reptiles, and a rabbit, also in an aquarium by herself. Other than being a bit on the thin side, a check-up determined that Clover was otherwise healthy. 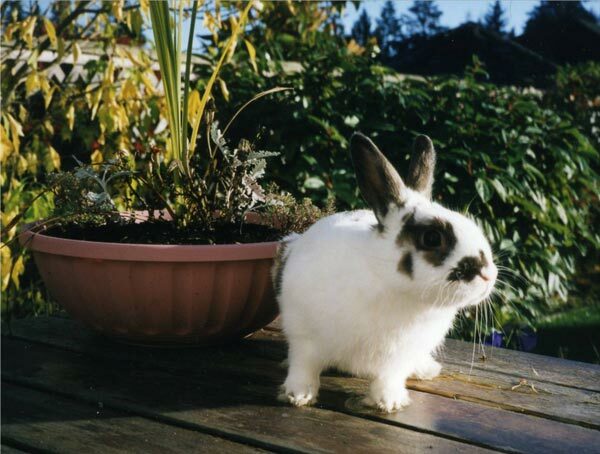 She made friends with our other rabbits and enjoyed her times outdoors, exploring the gardens. Pookie also arrived about the same time, after we were contacted by someone who said that neighbours had threatened to leave her behind on moving day. The kids had completely lost interest and cleaning the hutch had become too much of a chore. 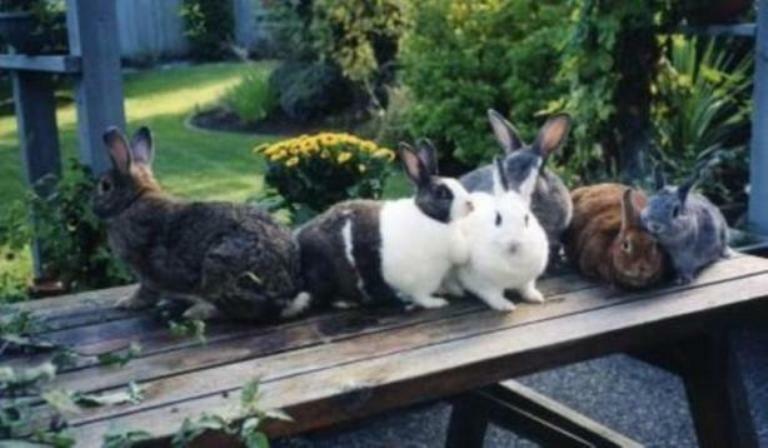 A North Vancouver family was renovating their home and had put their three rabbits in an enclosure on the front lawn. Within a few days two of them had escaped to a wooded area at the end of the street. Bunnykins was then put in a tiny cage at the end of the driveway. Residents, the letter carrier, and visitors all saw her sitting there, month after month. Finally we were notified of the situation, and on a rainy evening we went and picked her up. The sad reality is that this is not an isolated case. 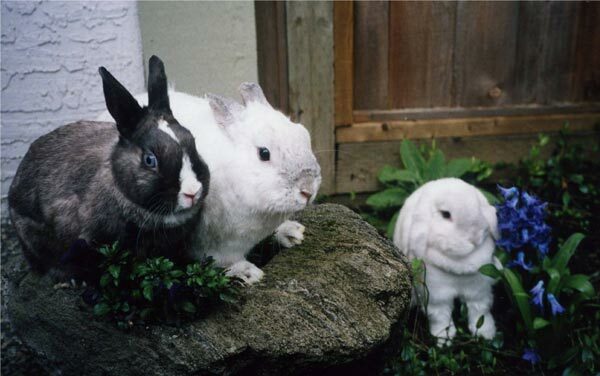 Domestic rabbits are abandoned by heartless humans all the time. Aquila was about a year old when we were given her by a young girl who said she was aggressive and picking on her other rabbit. Her friends all advised her not to bring the bunny to the SPCA. 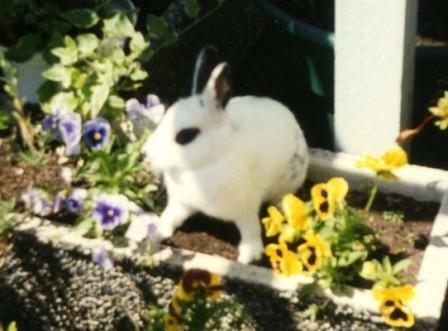 We determined that circumstances were such that we felt it in the rabbit's best interest to have her live with us. After several months of introducing her to our various other rabbits, she decided that Johnny, one of our singles, was the right match for her. 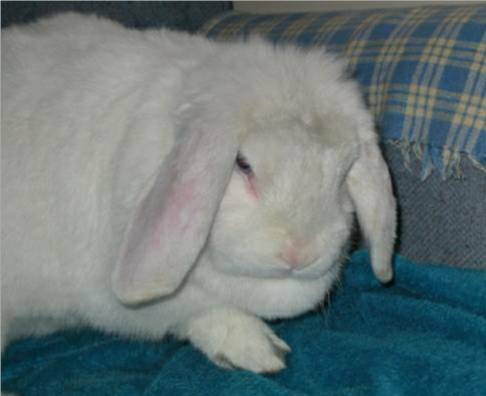 Background: He had been living in squalor with a number of other bunnies when the SPCA was called to investigate. Most were voluntarily surrendered on the spot and over the next week the 'owner' brought the remaining rabbits in to the area branch. Many had upper respiratory infections. We had our vet examine Johnny and several others who were transferred into rescue. It took quite some time before all were healthy, and ready to meet new friends. Our North Van. District Animal Welfare Shelter was home to Bacchus for about six months, when I was asked if we had room for him. 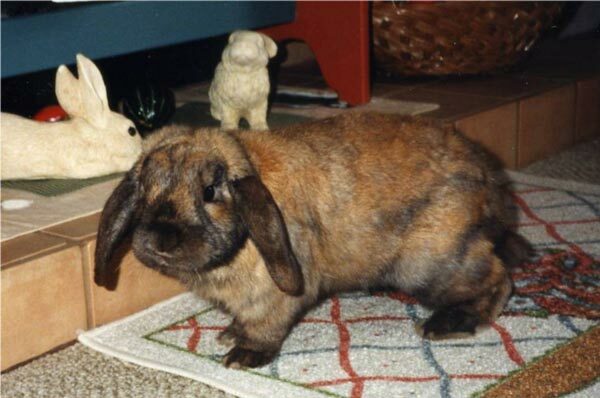 He was undernourished when found, and thought to be an "older" bunny. However, with good care and a nutritious diet, he gained weight and began to get quite rambunctious. Despite a great personality, there was no interest in him. Other than a bit of hearing loss, he's in fine shape and enjoys his visits with the others. Henry was also a stray from across town, and as is the usual case, remained unclaimed. Posters with his picture were widely distributed but the few calls received were from less than desirables. It's a sad fact that we have so little regard or compassion for these (and all) creatures. Fraser Valley Auctions is where Newton, a baby Lionhead, came from. The auctioning of livestock, with everything from goats, pigs, sheep, cattle, ducks, and rabbits, is heartbreaking. Whether these animals are sold to other farmers for 'fattening up' first or whether they are bound directly for slaughter, they are simply regarded as 'product.' Offloaded by sellers, and bought by people looking to gain financially, that's the reality. Their lives don't matter. A few are lucky, and are bought by rescuers, sympathetic to an inevitable end. Daphne, a New Zealand, commonly used in meat production, was bought by a young family, and when the day-to-day care became too much, the back door was deliberately left open, and she and two others were left on their own. Luckily, the outcome was good, and all were saved. Pebbles was found as a stray and brought to the North Vancouver District Animal Shelter in early February 2008. She had a myriad of problems and today still has occasional seizure-like symptoms as well as some difficulty using her front legs. Rabbit Advocacy continues to enjoy a working relationship with the shelter and is actively involved in making the community a better place for our four-legged friends. As well, we recently took in two 'older' bunnies, Xiao Bai (head tilt) and Xiao Hei, from a couple who needed to make room in their condo for the arrival of their first child. 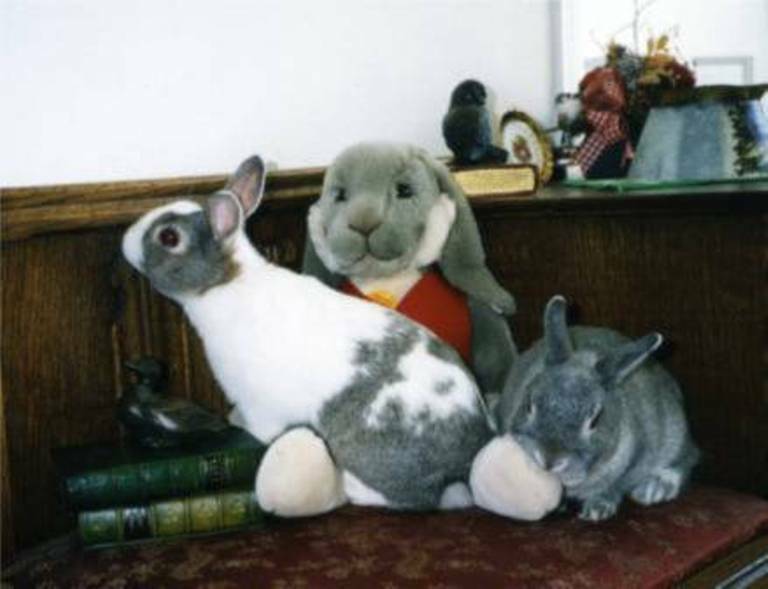 They had tried for some time to rehome their rabbits, but the few offers they received were unsuitable. Sadly, finding good homes is a real challenge and most people cannot commit to giving them the quality care and commitment they deserve. 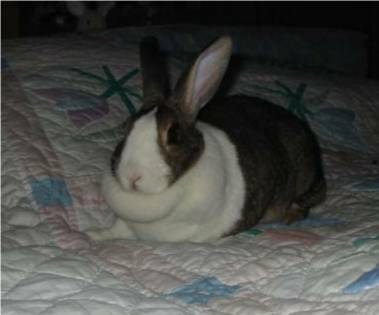 Considering that most rabbits have a poor quality of life, is it fair that we keep them as pets? 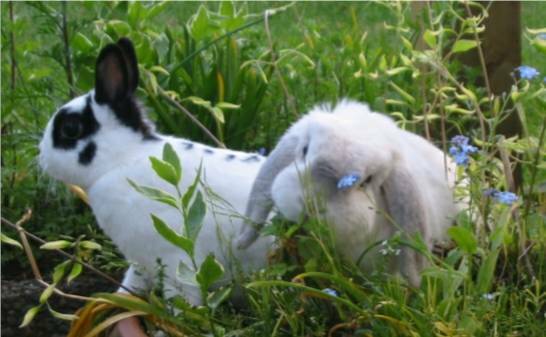 Rabbits are social and active creatures, and enjoy their freedom as much as we do. It's not okay to leave them in a backyard hutch or locked in a tiny cage where fundamental needs are ignored. Left to languish in solitary confinement before death offers a welcome escape is the grim reality for many. These are society's little prisoners, the ones who need our protection and our voice.